Every Singaporean loves a good ghost story. From abandoned buildings to silent cemeteries, it stirs up our innate curiosity and sends our imagination running. But we’re pretty sure there exist the few brave ones who are capable of conquering the fear of the unknown and venturing into them. But how do you tell a real haunting from the numerous tales that usually begins with “I’ve heard this from a friend of my friend…” apart? 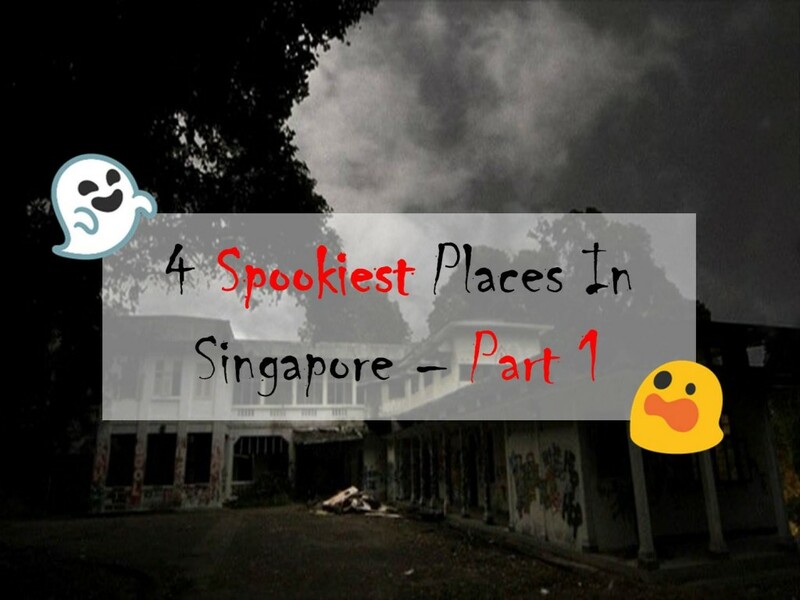 Fret not, we’ve explored the spooky corners of the Internet to bring you a handpicked list of four terrifying locations in Singapore! It’s only natural we should begin the list with one of the most infamous haunts in Singapore. Built in 1935 by the British forces, Old Changi Hospital has seen more than its fair share of death. It was later converted into a prison camp during the Japanese invasion and was witness to the brutal torture inflicted towards countless prisoners of war. The hospital eventually reverted to being a sanatorium after the war until 1997, where it was later abandoned after the formation of Changi General Hospital. With its rich history, Old Changi Hospital quickly gain its reputation as a hot spot for restless spirits and ghosts alike. Many have reported sightings of shadowy figures or of hearing terrifying screams whilst exploring the hosptial’s abandoned hallways. Even the crew of ‘Haunted Changi’ who were filming their documentary at the location, recounts eerie paranormal experiences during their stay. Unfortunately, the popularity of the place eventually caught the notice of the authorities and security of the infrastructure has tightened. Essentially, venturing into Old Changi Hospital today will mean contending with both the living and non-living. Situated at East Coast Park, the Yellow Tower (also known as the Amber Beacon Tower) may seem inconspicuous to many onlookers. At first. It’s only when one learns about the story behind it does its horror take root. The urban legend tells a tragic story of a couple who were attacked by a gang of thugs. The boy was knocked unconscious by his assailants whereas the unfortunate lady was brutally gang-raped before eventually stabbed to death. After the assault, many passersby claimed to have sighted a lone female figure at the tower and hearing her alleged screams for help. Over the years, groups of paranormal investigators have attempted to communicate with the female’s spirit with mixed success. A few videos and articles were posted on the Web as attempts to prove that the story was no mere myth. A similar case that took place in 1990, where a couple was attacked at the same location. The woman, like the urban legend, died of inflicted stab wounds. One thing’s for sure, it’s definitely a place you don’t want to be alone at in the middle of the night. Bedok has always been the location to a collection of horror stories. After the recent suicide cases in the Bedok Reservoir, the authorities were pressed to not only barricade the area, but to also install suicide hotline signs. With numerous pontianak sightings reported, Bedok Reservoir is probably not the place for the faint-hearted! One of the more popular stories revolves around a block of flats that were briefly abandoned before being demolished by the state Reason for the blocks’ demolishment range from a family suicide case to brutal murders committed in the lift. Whatever the main cause was, residents would report the feeling of being watched or having witnessing flickering lights in the albeit abandoned building. But the most renown tale has to be the one revolving around Bedok North Ave 4, where a mother and child had reportedly jumped to their deaths from the 25th floor. Under the pressure of money loans and a cheating husband, she had worn a red dress on the fatal day and was rumoured to have scribbled “it’s not over, darling” on the walls, with her own blood. Her husband was, expectedly, unable to find a buyer for the house but had decided to move in with his mistress. After the birth of their son, things began to take a turn for the worse. Their son soon became acquainted with an imaginary friend, whom he affectionately refered to as “Kor Kor” (brother). The parents thought nothing about it until their son claimed that “Kor Kor” was bullying him. The husband, however, stubbornly deemed it as the child’s imagination and refused to hear anything about it again. One fateful night, however, when their son burst into the room with the same complaint, a soft cry was heard originating from his son’s room. He chillingly recognised it as the same cry that his late child used to make. He ordered his son to stay in his room while he investigated the strange noise. After a fruitless search, he returned to his own room, only to be greeted with the sight of his son standing on the window ledge. With a smile and the claim that “Kor Kor” told him that he could fly, his son leapt out of the window and to his death. Even now, real estate agents are having a hard time finding prospective buyers as they’d be warned by the neighbours’s tales of hearing unexplained sobbing and laughter emitting from the empty house. It would be doubtful to claim for our MRT stations to be haunted with spirits and ghosts. But after some careful digging (pun intended), we discovered how some of these stations can turn into a popular spot for the “other” crowd. As some of you may know, some stations used to be home to cemeteries and graveyards. As a result, it is rumoured for disturbed spirits roam around the platform, looking for their “homes”. Popular haunts include Tampines, where many have claimed to spot the spirit of a man who jumped into the train tracks. There is also Novena, where spooked SMRT staff officers on duty have reported sightings of ghostly coffin bearers in the train tunnels. A popular ghost tale surrounding Punggol MRT reached its peak during its construction. Plans were made to extend the North-East MRT line further than Punggol, but construction workers eventually encountered inexplicable difficulties such as haywire machinery and unexplained drained batteries. The breaking point was the sighting of a figure walking down from the tunnel at late night, with its severed head floating a few inches away. The workers believed that it was one of their own, who was accidentally beheaded during a tragic accident. Needless to say, the workers refused to continue the expansion and the project was abandoned. If you’ve got through these 4 scary places, congratulations! We hope you’re not too spooked. For more scary stories and pictures, stay tuned for part 2.